The GLY series weight/injection filler is a high-tech product designed and developed by our company. It mat suit for different viscosity of water agent, semi-fluid and paste, it is widely used in the product filling of foodstuff, cosmetics, medicine, grease, daily chemical industry, detergent, pesticide and chemical industry. Using the straight filling way, may be used in the different vessels, needn’t add any parts. 1.1 The series machine, its design compact and reasonable, the appearance artistic and scholar. 1.2 Choosing the international brand of electrical components. The main powered cylinder, chose the Taiwan Airtac double-action cylinder and magnetic switch, the Japanese Mitsubishi PLC computer, photo electricity and Taiwan-manufactured touching screen, ensuring a good quality and lasting steady performance. 1.3 The machine has a convenient maintenance, needn’t any tools, may easily dismantle, clean and fix adjustment convenient. The measurement’s adjustment, may at first large range adjust to approaching measurement, then micro adjust. Make not to fill when there is not bottle or lack of bottle, ensuring the accurate measurement. 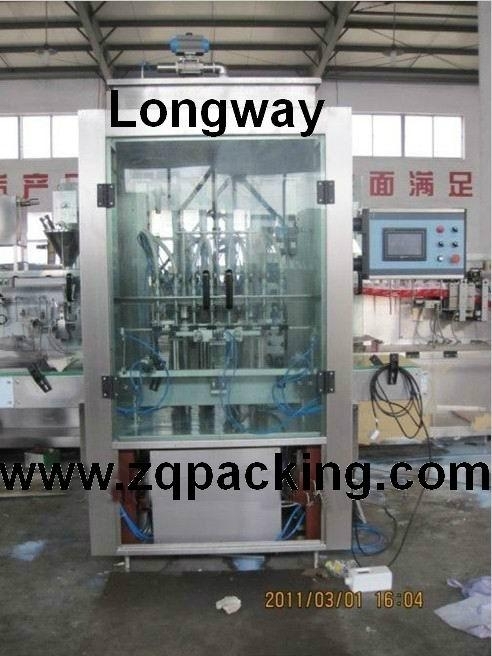 machine has speed-adjustable bottle-conveying tape, high strength stainless steel framework, firm and durable. 1.5 Considering the different viscosity of user’s material especially set a filling suffocated valve of preventing drop and preventing feathering, as well as a descending filling lift system. In order to make the material-falling aim at the bottle mouth accurately, designed a horizontal bottle-aiming fixture device, ensuring the aim’s correct. 1.6 Because of the complicated material varieties, the machine set a weight filling program to fix the sprue parameter, for the thin liquid, may use the atmospheric timing filling way to decrease production cost ad to enhance the production speed. The system needs not add any parts, may decrease the equipment’s repeated investment, and realize the one-machine multi-use. 1.7 The machine’s filling system used the chuck quick-fixing hygiene joint. The cylinder’s whole body, from to top to the bottom, needn’t any tools, may easily dismantle, clean and fix. Its structure design simple, operation maintenance convenient.